By GreenEyedLillies on December 18th, 2008 . Filed under: Baby, Books, Crafts, Stationary . Preserve your sweet memories in this adorable cupcake-shaped album. Use this complete kit to make the 7 page (14 layout) keepsake album pictured here. Album measures approximately 6 x 6″ at its widest points. A lovely present or treasured gift for yourself. 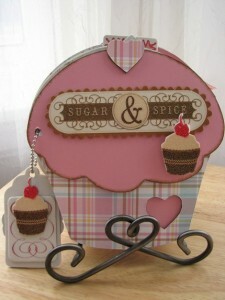 Kit contains the cupcake chipboard album, patterned papers, cardstock, diecuts, ribbons, embellishments, etc., etc! LIMITED EDITION – There is a set number of these kits made. Once they are gone, they will not be re-issued. Packaged and ready to ship. Available at Scrap Can Do.